Do you own an iPad? Are you annoyed of iTunes? Do you want an alternative to iTunes that is easy to use, quick in functionality, and powerful in performance? Or do you want to copy music to iPad without iTunes? Well, you’re in luck. This guide lists some of the best tools available in the market as alternates to iTunes for transferring music and audio files to your iPad. iMusic is an amazing alternative to iTunes. It is a cross-platform tool that lets you transfer music between iPad, iPhone, iPod, Android phone, and iTunes library easily and freely. You should never worry about the data erasing issues occur to your device. It is able to display all songs in your iTunes library, letting you transfer music from iTunes to iPad without iTunes. 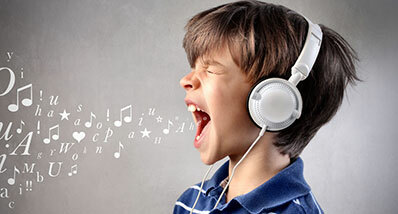 It is the best music transfer for people who like to enjoy music on the go or share music. Transfer music from iPhone/iPod/iPad/Android phone/iTunes to iPad without a hitch. Download music from over 3000 music sites and the built-in music library lets you discover and download the hottest songs for free. 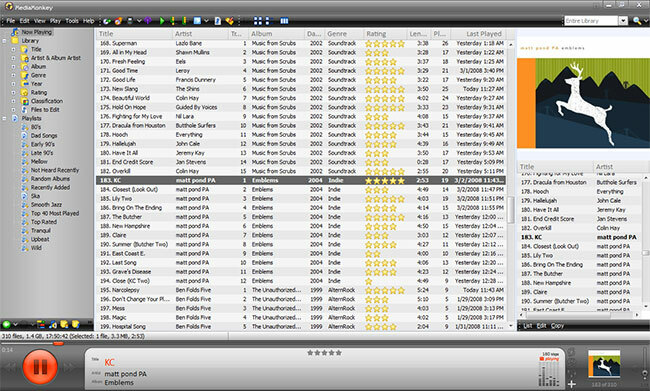 Recover music from any music site and radio station that doesn’t allow you to download; all the recorded songs will come with music tags, like artist, album name and cover. Before begin the process, come to download it's free trial of iMusic to your pc, it supports both Windows and Mac. Lauch iMusic, then connect your iPad with your computer via a USB cable. When connected successfully, you can see the device appear under the “DEVICE” window. Note: Before connecting your iPhone, iPod or iPad to your computer, please disable the “automatically sync” in iTunes Preferences first from iTunes Preferences > Devices > uncheck “Prevent iPods, iPhones, and iPads from syncing automatically”, in case of data erasing by iTunes. After go to the device page, the interface will show you different options, choose "Transfer music to other device "
Option 1: Go to the library, select the music you want to transfer to iPad, right tap the mouse, choose to export to iPad. Option 2: The second option is after select the music wanted to move to iPad, click the "export" icon on the top right corner, finish the process to tranfer music from PC to iPad. That's it. very easy and simple to finish the whole process to add music to ipad without itunes. Click here to get other tips about how to copy playlist from iPhone/iPod/iPad to iTunes. An excellent tool that allows you to transfer a variety of different multimedia files (such as music, videos, podcasts, and PDFs) to and from your iPad. 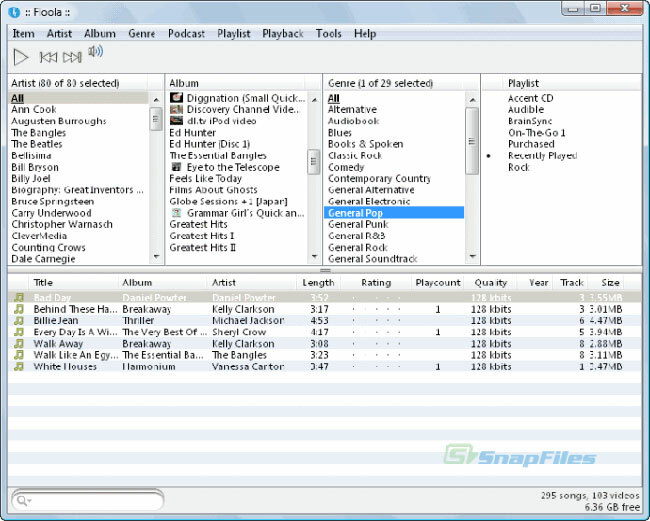 It is a powerful tool that allows you to import and export music files as needed. Supports a wide range of music formats. Allows you to manage music files on your iPad. The trim function in the application allows you to trim your favorite audio track into a ringtone. Supports both the latest and older versions of iPad. Allows you to sync your iPad’s music library with your computer’s music library. You can connect and manage multiple iOS devices simultaneously. The application automatically detects media info and device info. Does not have a built-in music player functionality. Some features are limited only to the paid version of the software. Supported Operating Systems: iOS 9 or below (for iPad), Windows 10 or below, and Mac OS X 10.9 or above. 4Media Software Studio is the complete companion for your iPad. It allows you to manage all media files on your iPad efficiently and reliably. The software is available for free online. And it could successfully achieve add music to ipad without itunes. Allows transfer of files from iPad to computer and vice versa. Supports image, audio, and video files. Also supports connectivity with iTunes. Lack of support with latest operating systems. Does not support conversion from one music format to another. Not as stable as some other software. Supported OS: iOS 8.3 or below, Windows 8 or below. An alternative to iTunes that allows you to transfer apps, music, videos, documents, and many other file types from your iPad to your computer. The application has gained much popularity over the years owing to its reliability and speed. Wonderful user interface that makes it easy to find the required options. Supports connectivity with multiple devices simultaneously. Supports in-app conversion with file transfer. Beautifully designed, simple to use interface. Allows you to create, manage, and delete playlist. Functionality for backing up and restoring data. Not specialized for just-copy purposes i.e. it has a lot of additional tool which makes the application oversized. Supported OS: iOS 9 or below, Windows all versions, and Mac OS X all versions. A free tool for managing media on your iDevice. CopyTrans manager is a multimedia software that allows you to perform the required operations on your music files. Adding music to ipad without itunes is very simple . Supports preview and editing of audio tag information (that includes artist name and album art). Add, edit, or delete playlists. Portable music player built-in for music playback. No need for iTunes, CopyTrans takes care of all copy and transfer operations for your iPad. No installation, just run and go. Supports the drag and drop feature. Limited support for file types – only supports music and videos. Because the app doesn’t install, it does not have any memory for itself therefore you have to save files to your computer/iPad or else they will be deleted. Supported OS: iOS 9 or below and Windows all versions. A transfer tool for Mac OS and Windows that allows you to easily and reliably transfer music from your iPad to your computer. Through SharePod, you can manage, play, delete, and organize music files on your iPad. Enables transfer of music from iPad to computer and vice versa. Organize music on your iPad by managing playlists and music library. Build-in music player for music playback. The software is shareware that asks you to ‘Go Pro’ after 55 songs have been transferred/played/converted. Supported OS: iOS, Windows, and Mac OS X. A free alternative to iTunes that is compatible with both Mac and Windows. 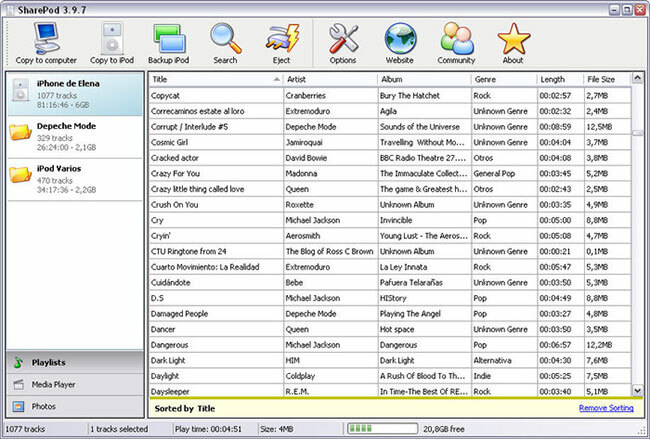 The tool is structured around the iTunes interface to ensure users have the same comfort level as they do with iTunes. Transfer files from you iPad. Organize, arrange, delete, and backup media files on your iPad. Supports iTunes (you can access songs from your iTunes library). Allows creation of music libraries and playlists. Good tool for syncing and backing up music files on your iPad. Freeware – no hidden costs. Not every easy to understand – no English user manuals available. Support OS: iOS, Windows, and Mac OS X. Media Monkey is a music manger that provides functionality for transferring, syncing, and backing up your music files to and from your iPad. The process is straightforward and overall, the application is very easy to use. Built in multimedia player that allows you to play both music and video files. Organize, sync, and manage files on your iPad and computer. Sync your music libraries across all platforms. 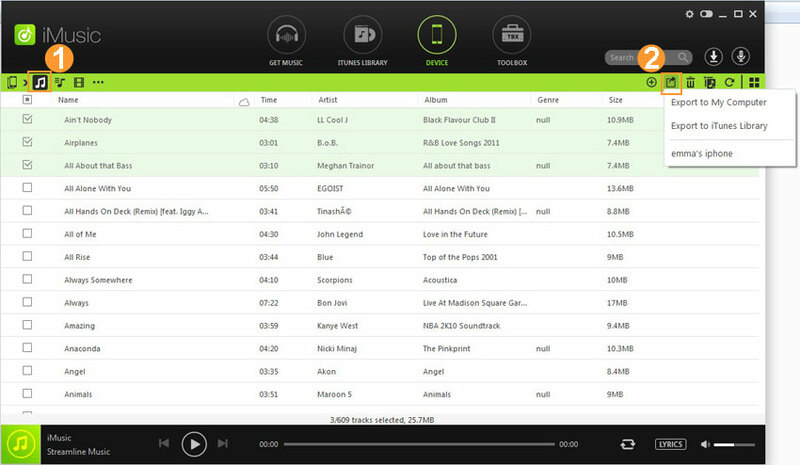 Manage and organize all your music files through one central application. The interface is a little messy. Some of the best options are available in the paid version. Supported OS: iOS and Windows. PodTrans is another great alternative of iTunes that provides a quick way of transferring music files from your computer to iPad and vice versa. It does the transferring in the most rapid and effortless manner, hence it is faster than many other software. Creates a comfortable environment for users. Identifies the device on its own and displays a short summary of your iPad and the available storage. Allows organization of music files. Some features are not very clear and instructions have to be viewed on the website. Allows backing up and restoring data. 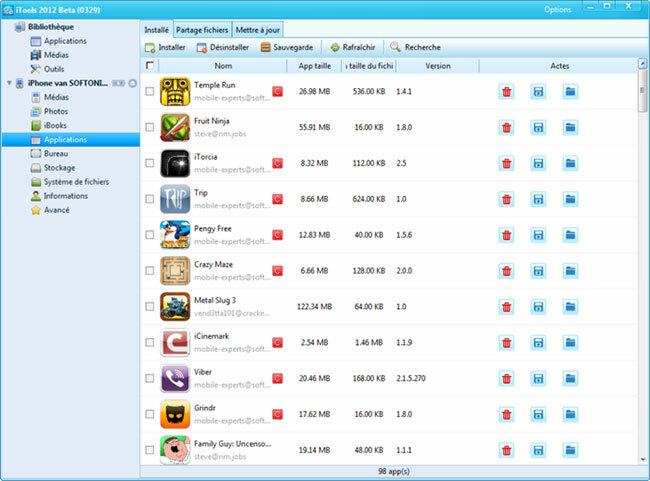 Floola is a free application that manages files on your iPod. It runs perfectly under Mac OS X, Linux and Windows, and does not require installation. 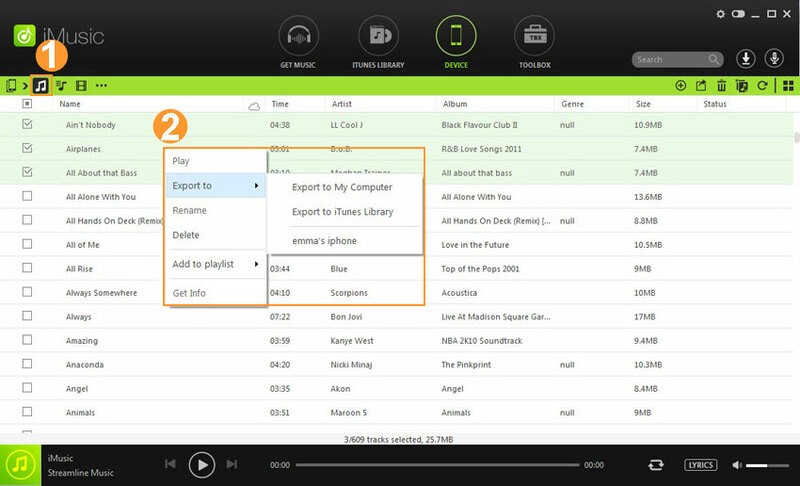 Floola provides you with multiple options like renaming, copying and deleting music files, managing playlists and adding artwork and lyrics. So it is a perfect tool to transfer music to ipad without itunes . Manages multimedia files on your iDevice. Easy to understand and easy to use interface. Allows free transfer of media to iPad. Conversion utility has some bugs. Not very good with non-Apple jukeboxes. Supported OS: iOS, Mac OS X.